U.S. Geography with Flat Stanley HD helps kids learn to name states from their shape and gives them important information about each one that is likely to show up on those school tests about the fifty states in middle grade school. U.S Geography with Flat Stanley works as intended, and provides an entertaining way to help kids study states, capitals and other information that many will need in middle elementary school. In case you’re not already familiar with Stanley, the character comes from a popular children’s book, and many classrooms already use him as a geography lesson. Since Stanley is flat, he can easily be mailed around the country and travels well. This app dresses him in an aviator costume and has users send him around the country by airmail….using a slingshot! Children can aim by watching a line of dots and can see if they will hit the requested state because it is highlighted when the slingshot is aimed correctly. Users can tap each state to see pictures and printed information about the area, and one large concern is that the captions on these pictures have quite a few problems. Some are not printed in their entirety, trailing off in ellipses instead of finishing sentences. Examples of this are the Cedar Point picture’s caption in Ohio and the apple blossom picture caption in Michigan, but the problem is widespread. Other captions contain grammar or spelling errors, such as neglecting to capitalize Henry Ford’s last name in the Michigan section and using “site” for “sight” in the Northern Lights caption in Alaska. U.S. Geography with Flat Stanley will help students learn to label states on a blank map. It is very helpful to be able to study by regions, but the divisions are different than many classrooms use. Some programs divide the country into five or six regions, and others use eight. This app has seven, and calls the Midwestern states “North Central,” which is quite unusual (at least here in the Midwest!). In other words, the regional divisions in this app will help your child study in sections, but chances are very good that they will not match up exactly with the regions as presented in the classroom. The app asks users to send Stanley flying via slingshot to the requested state. Once he has landed in the right spot, the screen switches to a spelling activity that presents the letters of the state name scrambled for students to use to spell the target state. However, the instructions include the state’s name, so it would be an easy matter for kids to simply copy it, or there is a handy “skip” button at the bottom of the screen. Perhaps the directions could disappear once the student begins to spell? Once the letters are in place (or the activity has been skipped), users are taken back to the map page to try for another state. It’s quite possible that students will completely skip over the informative section that needs to be accessed by tapping the state’s outline. This section contains information and pictures about the state’s flag, capital, flower, bird, and a few unique features or attractions. Unfortunately, there is no way for the students to see where the capitals of the states are located, and that is often on the school tests, as well. Playing with a familiar character is always an attraction for many students, and Flat Stanley will be no exception. The mechanism of Stanley’s travel will also be a draw for young students, too. Who can resist a chance to use a slingshot? It does take a little bit of practice to get the correct range and direction, but once players learn to use the cuing system, they will shoot accurately with ease. The app rewards correct shooting with a fanfare and access to the spelling page. Correct spelling is rewarded with a fanfare and a return to the map for another round. If all states in the region are hit on the first try, the app congratulates the user and moves on to the next region. U.S. Geography with Flat Stanley might have a bit more play value if there were a trivia-type game to assess the information contained in the informative sections. This would also encourage kids to use that section instead of skipping it all together. U.S. Geography with Flat Stanley is a good value for middle elementary students who are studying states and capitals in social studies. The app will give plenty of practice with matching states to blanks on the U.S. map and offers much of the additional state information that is typically covered in school. 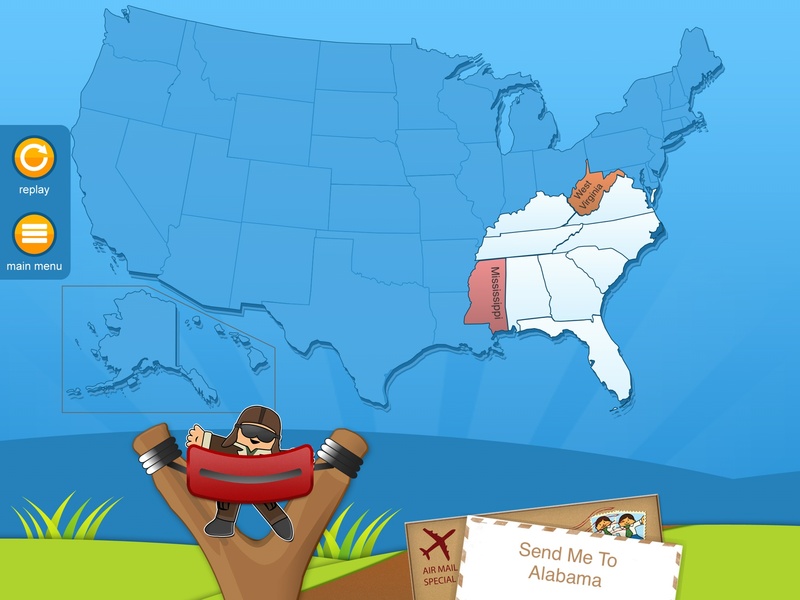 Kids will enjoy the sling-shot mechanism, but can possibly choose to skip exploring the visual and printed information about each state, and the app does not help kids learn the locations of the capitals.